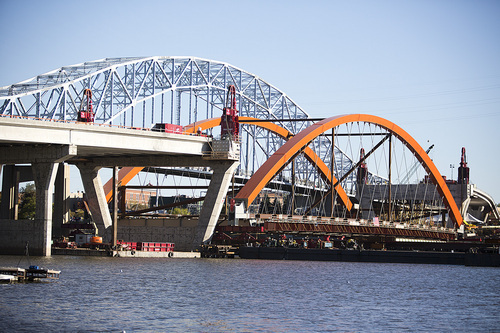 A major construction feat was recently completed at the Highway 61 bridge project in Hastings, Minnesota when the 545-foot, 6.5 million-pound main bridge span was hoisted into place, 50 feet above the Mississippi river. 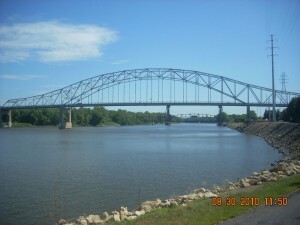 The main span, the longest free-standing tied-arch in North America, was constructed on the shore of the Mississippi River, about a mile upstream of the river crossing. Placed on massive dollies, the span was rolled onto a set of six barges and floated downstream. Once positioned under the piers, hydraulic jacks on top of the piers slowly lifted the span into place. Around midnight on Sunday, September 23rd, 2012, the lift was complete. 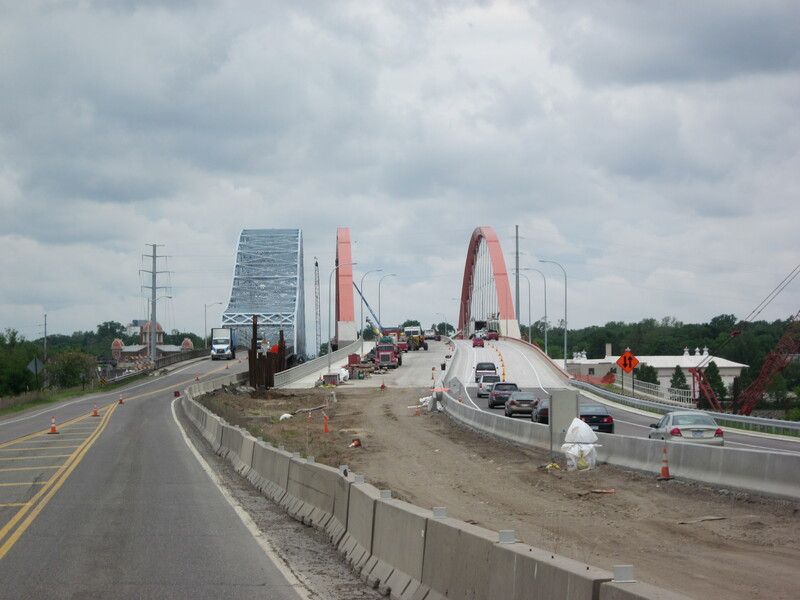 By noon of the following day the span was secured in place and the existing bridge was reopened to traffic. A time lapse video of the entire process can be viewed below or on YouTube. 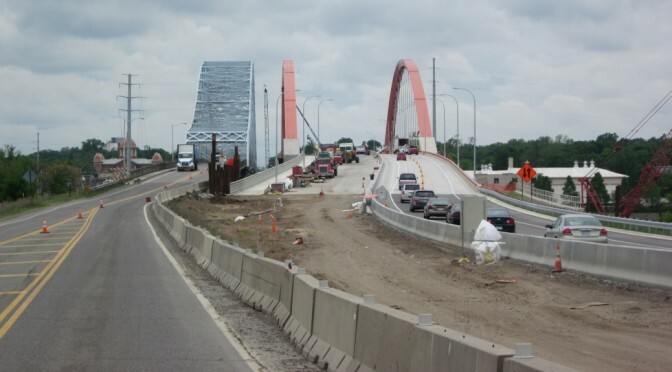 Some new pictures of the Hastings bridge project in Hastings, Minnesota have been added to our Picasa Web Album: Hastings Bridge Construction. 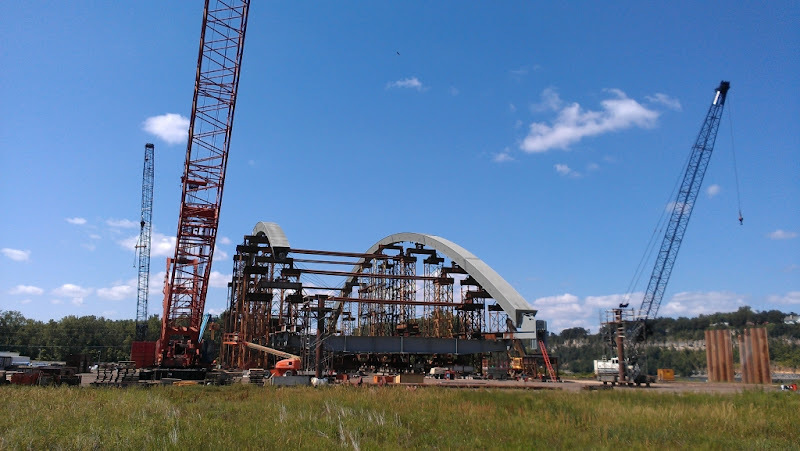 The pictures were taken by myself, David Graham, who has been in the area working on a load test program for a new bridge crossing the St. Croix River near Stillwater, Minnesota, and Griff Wigley, our blog coach who lives nearby in Northfield, Minnesota. 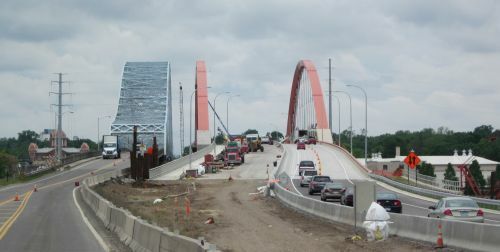 The pictures show some of the recently poured deck sections, the completed piers, and the main span arch construction. Once completed, the main span arch will be moved onto barges, floated downstream, and lifted into place in one piece. We have chronicled this interesting and successful project in several previous blog posts that can be found here. 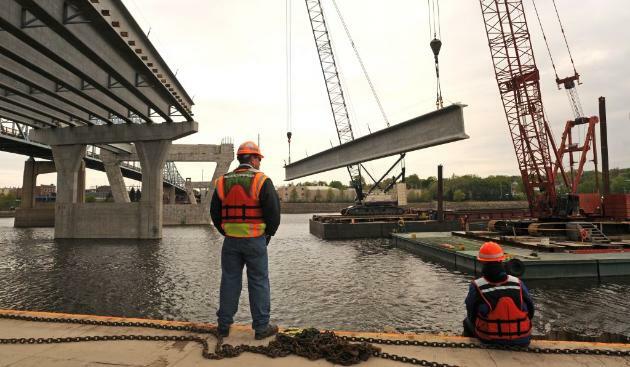 Massive prestressed concrete girders, some of them setting a record for the longest concrete girders used on a Minnesota bridge, have been set at the New Hastings Bridge, currently under construction in Hastings, Minnesota. The largest girders are 174 feet long, 8 feet tall, and weigh 108 tons! There is a video of one of these huge beams being delivered on a 16 axle truck, below. 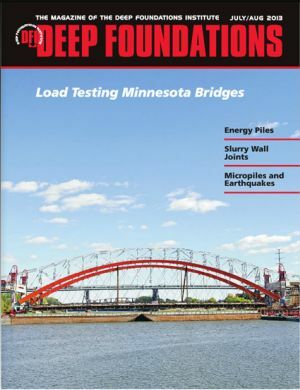 An article from the December 2011 issue of Concrete Products magazine about the girders can be found here. To date, all of the girders between the north abutment and main span have been placed. Crews are preparing piers 5 and 6 for the main span steel arches, which are scheduled to be floated in by barge and lifted into place late this year. 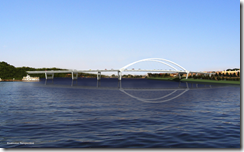 MnDOT has two web cams where the bridge construction and the arch construction can be viewed. The Minneapolis Star Tribune has also been following the construction. Their latest article, which hails the bridge as “a monumental marvel,” can be found here. Well, I, David, have survived my first (and hopefully last) winter in Minnesota. I spent most of January and February observing the installation of the Pier 5 drilled shafts at the new Hastings bridge project in Hastings, Minnesota. In addition to the drilled shafts, there has been a lot activity at Hastings since Aaron last blogged about this project in January. A link to his post is here. All of the ground improvement piles for the column-supported embankment have been installed and approximately 75% of the caps have been poured. The 42-inch piles and pile caps for Piers 8, 9, and 10 are also complete. Piles for the north embankment retaining wall have been installed and construction of the wall has begun. Excavation for the rock bearing spread footings that will support the south land piers is in progress. Work at Piers 6 and 7 and on the north shore are currently on hold as the Mississippi River is experiencing its annual spring flood. The water level is about 14 feet above normal elevation. I have taken the pictures Paul and I have collected over the last few months and uploaded some of the more interesting ones to a Picasa web album. 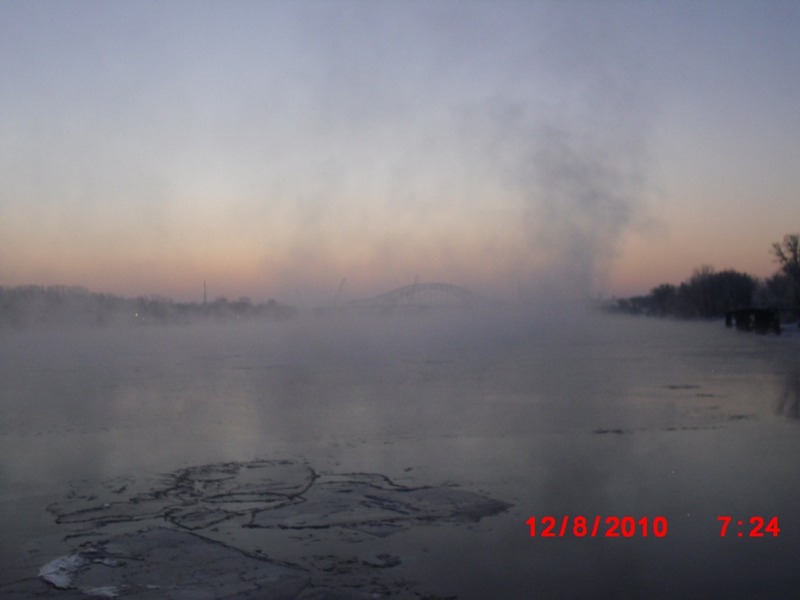 The pictures are generally in chronological order and cover most of the construction process from November of 2010 right up to the end of March 2011. A link to our our video of a Statnamic load test at Hastings that Aaron blogged about is here. Good morning DBA fans! I’m here to give you the latest news on the Hastings Bridge project. The weather has been a bit chilly in Hastings, MN but that isn’t stopping progress. 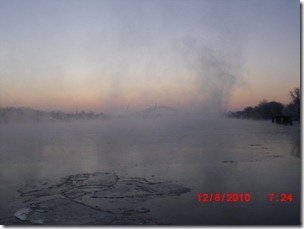 Paul provided the update below and this picture of one of the beautiful mornings on the site. Installation of the 12.75” diameter open-ended pipe piles for the column-supported embankment (CSE) is well under way. Each pile is around 165’ in length and will support a geogrid-reinforced load transfer platform (LTP). Light weight fill, or geofoam, will be used to transition from the CSE into the existing embankment. Installation of the North Embankment retaining wall piles has begun and is about 50% complete. The Pier 10 test pile was installed and tested with AFT’s 30MN axial Statnamic device. The pile is a 42” open-ended pipe pile with 7/8” wall and is embedded about 190’. Check out the video below. The Pier 6 test pile has also been installed and tested axially and laterally with a Statnamic device. That’s all for now, but come back later for additional updates on this exciting project. Thanks for reading! 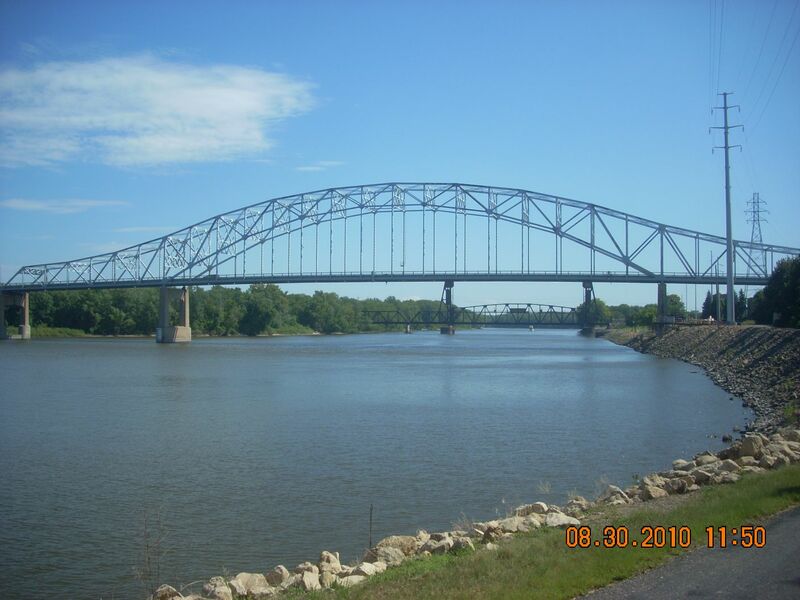 The Lunda/Ames design-build joint venture (Lunda Construction Company of Black River Falls, Wisconsin and Ames Construction, Inc. of Burnsville, Minnesota) has been awarded a contract to build the new Highway 61 Hastings Bridge over the Mississippi River in Hastings, Minnesota. 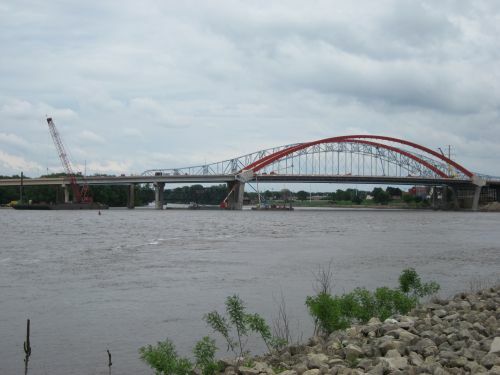 Parsons Transportation Group is the designer and DBA is performing geotechnical design of the bridge foundations and settlement mitigation as a sub-consultant to PTG. In addition to several relatively large approach spans, the new bridge will include a 545ft long free-standing arch main span with four lanes of traffic and a 12 foot wide common use pedestrian/bike path. 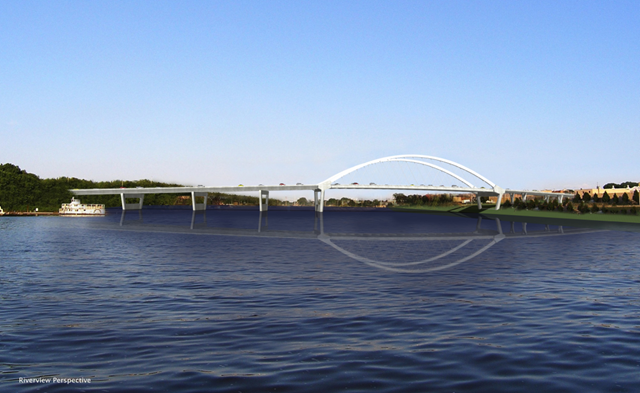 The new bridge will allow additional parking and an artistic plaza area south of the river. An anti-icing system will be installed to help achieve the 100-year design life. On the south side of the Mississippi River, the bridge foundations will consist of spread footings bearing on dolostone bedrock. The remaining bridge foundations will utilize 42in diameter pipe piles. Several Statnamic load tests, both axial and lateral, will be performed by our friends at AFT. Settlement mitigation is required beneath the North Embankment due to several relatively thick and deep strata of compressible fine-grained soils. The embankment will also be heavily instrumented to evaluate performance of the embankment and mitigation technique. Preliminary work including subsurface investigation has begun. The subsurface investigation is being performed by Braun Intertec under sub-contract to DBA. Test piles will be installed in early September, 2010 with subsequent load testing soon after. The awarded design-build contract is for $120M. The estimated project completion date is May 13, 2013.